Presumably inspired by the success of Hammer's many Dracula sequels, this is the best of the Japanese 'Dracula' trilogy, even though Dracula isn't in it. In fact, it's the best Japanese vampire film I've seen. With a strong cast, especially Yoko Minakaze as the mother, the film sustains a creepy atmosphere, helped by an effectively modern sound mix to put you on edge. The constant use of harpsichord music is a little annoying, and may remind you more of The Addams Family. Though the story starts off with the familiar set-up of a missing relative, there's sufficient surprises and plot twists in store. It packs in gory scenes as well creepy ones. It also beats Hammer to the modern-dress vampire tale. The film succeeds because it's grounded more in Japanese legend, with its shrouded vengeful spirit, rather than trying to adapt to the Dracula mythos of the west. Source Black Hole Reviews. 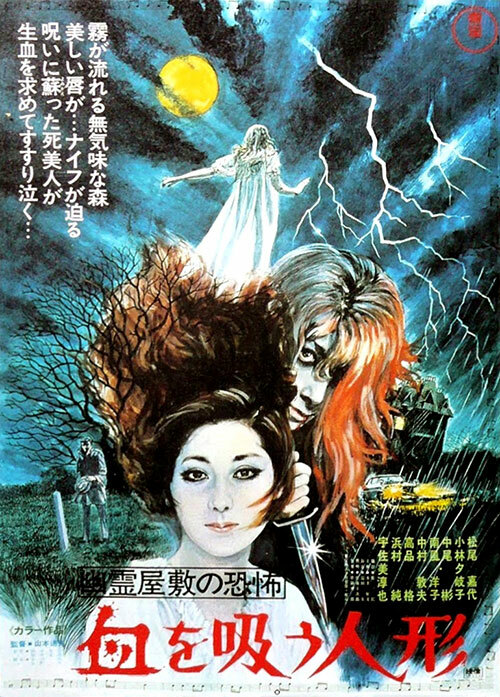 1 Response to "The Vampire Doll (1970) Michio Yamamoto"
Many thanks for the upgrade my friend.